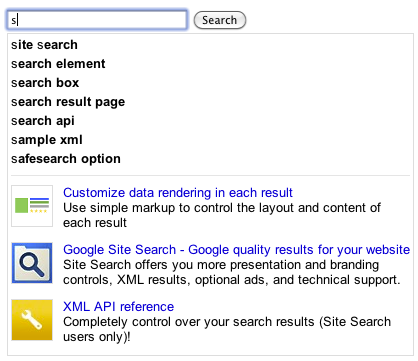 On Friday, December 09, 2011; Google announced through one of its Software Engineers, Min Zeng, "...Today we are announcing two major improvements" to Custom Search Autocompletions. Promotions are a great way to call special attention to a result by putting it at the top of search results and making it visually distinct. Now you can choose to display them in autocomplete too. To enable this feature, simply click Show promotions in autocomplete in the Promotions section of your CSE’s Control Panel. Note that promotions based on regular expressions or the $q variable will not appear in autocomplete. If you’d like to have promotions that appear in autocomplete but not in search results, you can add them via the new Autocomplete Promotion tab of the Custom Autocompletions in the Autocompletion section of your CSE’s Control Panel. Match mode give you options for how Google displays autocompletions. The following are now available in the Promotions section of your CSE’s Control Panel. Changes to match mode will require you to update the CSE code snippet on your site. Prefix (default) mode matches the opening words of the user’s query: “how to bake” will trigger “how to bake a pie”. Ordered mode doesn’t require the words to be in the opening, but their order must match the user’s query: “bake a pie” will trigger “how to bake a pie”. Any mode matches regardless of the order of the words in the user’s query. “pie bake” will trigger “how to bake a pie”. Google hopes these new options make autocompletions even more useful for your site. For more, read about Promotions in Autocomplete and Match mode.